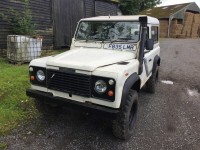 Land Rover Defender 90 300Tdi —- Sweet entry-level D90! Want to stop by: we are a "by appointment only" shop. Give us a call or send us an email to schedule a time to swing by. Copyright (c) 2015 ZombieMotors.net This site is not authorized by or affiliated with Land Rover. Rights Reserved.